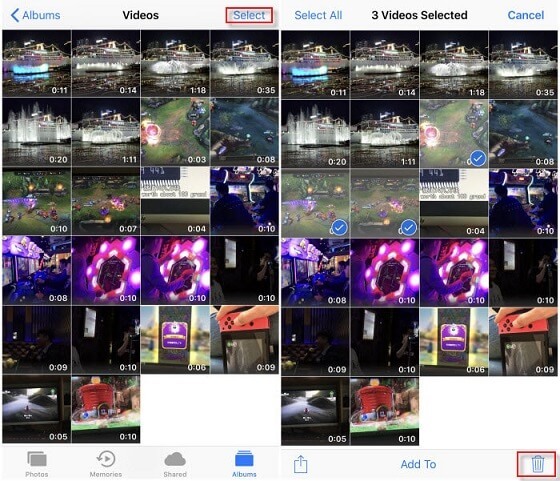 If you are going to permanently delete videos from your iPhone and have been manually deleting your videos, this isn’t enough. Your data can still be recovered by recovery apps. This is why you need to know how to delete videos from iPhone permanently and that’s exactly what we’ll be showing you how to do. The first method that we’re going to use is the most reliable method. For this, we’ll be using a program called iMyFone Umate Pro - a program which is specifically designed for permanently deleting data so that it can’t be recovered. Permanently delete any type of iOS data. Permanently delete any video on an iPhone, regardless of the format. Erase any data so that it can’t be recovered. Can even permanently delete videos from third-party apps. 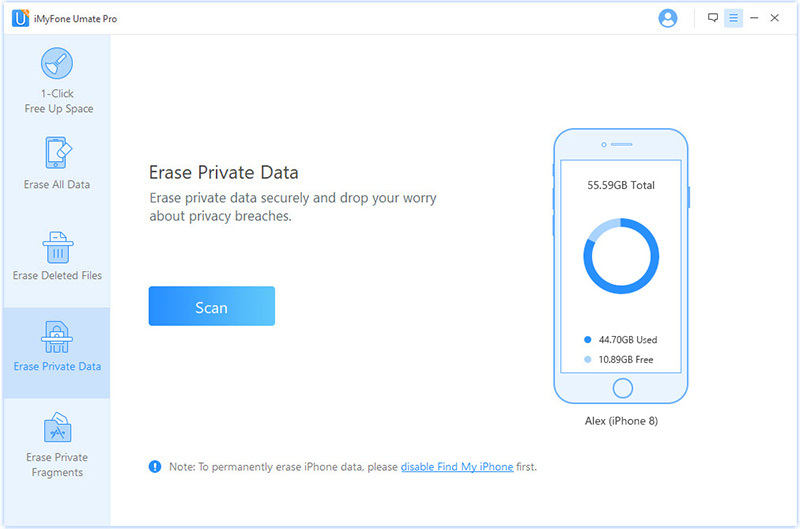 Permanently delete your personal data if you are getting rid of your iPhone. Follow our short guide below to permanently delete videos from your iPhone so that they are beyond recovery. Step 1. Start by downloading and installing iMyFone Umate Pro on your computer, launching it, and connect your iPhone using the appropriate USB cable. Step 2. Next, click on the “Erase Private Data” tab from the left menu and then on “Scan” to begin. Step 3. Once the scan is complete, click on the “Photos & Videos” data type to view all of the photos and videos which are currently stored on your iPhone. Select the videos that you want to have permanently erased. Step 4. After selecting them, click on “Erase Now” and after a few minutes, the videos will be permanently deleted. 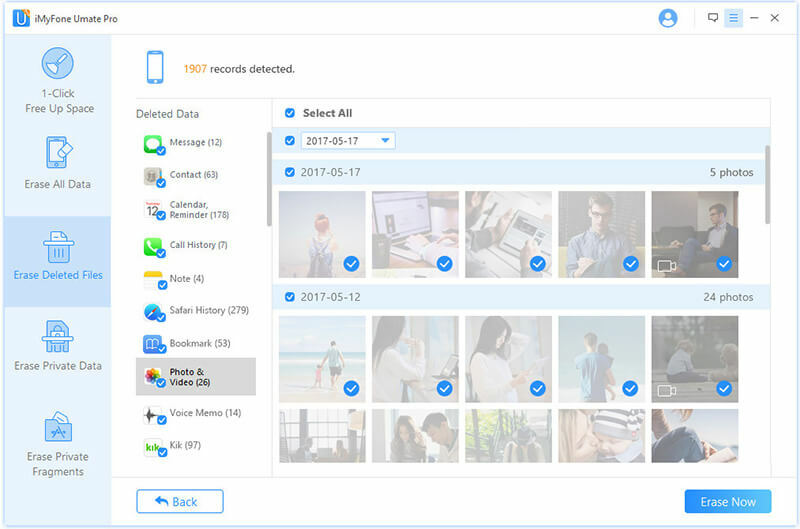 This is without a doubt the best program to permanently delete videos from iPhone and depending on whether you want to just delete your videos or you also want to delete other data, you can use iMyFone Umate Pro to permanently delete any data. 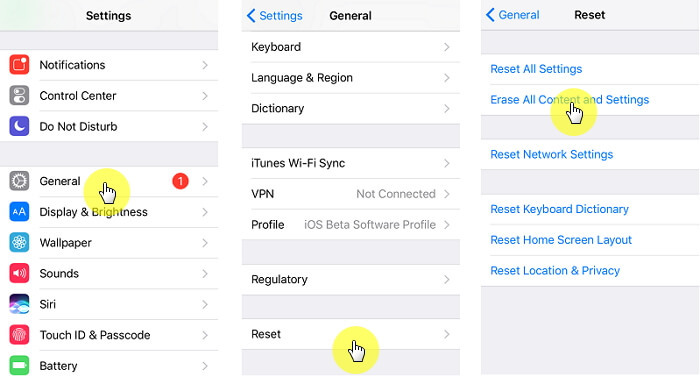 Another option that you have for learning how to delete videos from iPhone permanently is by factory resetting through the “Settings” app. Doing this is relatively easy although if you aren’t aware of the steps involved, follow our guide below. One important thing that you have to keep in mind when you use this method to delete your videos is that you shouldn’t take a backup beforehand. If you do this, videos can also be backed up, if you restored from backup, all your videos will come back. It defeats the point of permanently deleting them in the first place – this also applies to contact information, app data, and your photos too. Step 1. Unlock your iPhone and tap on the “Settings” app to launch it. Step 2. From the list of options that are shown, tap on “General > Reset > Erase All Content and Settings”. Step 3. You’ll be asked to enter your passcode, so go ahead and enter this now, and will also be prompted to enter your Apple ID (so that it can also be removed from your device). Step 4. Lastly, tap on the “Erase iPhone” button and the process will begin. 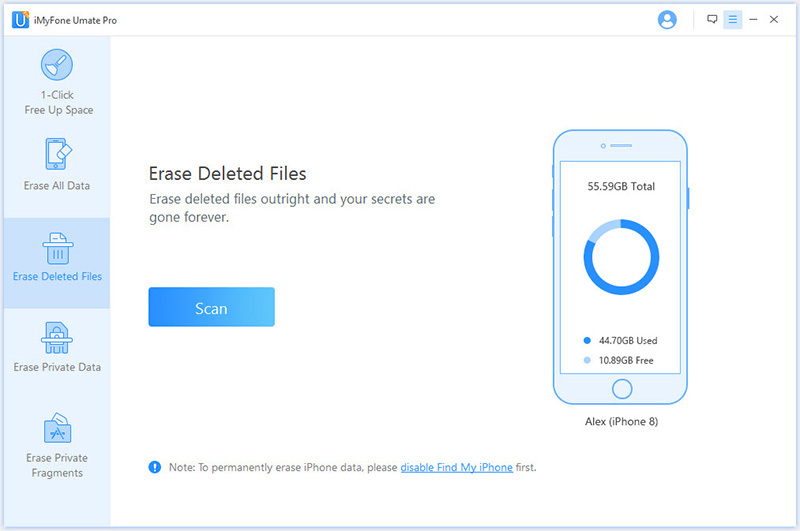 After it has been erased, all of your videos and other data will be deleted from your iPhone. The final method that we’ll be showing you is ineffective for permanently removing data because if you download a recovery tool, you can easily recover the data. Nonetheless, if you want to use the regular method for deleting videos from an iPhone, follow the steps below. Step 1. Unlock your iPhone and tap on the “Photos” app. Step 2. Tap on the “Photos” tab and then on “Select” at the top of the display. Step 3. Select any of the videos that you want to delete from your iPhone. Step 4. Press the trash icon at the bottom-right of the app and then on “Delete Videos”. Step 5. Now tap on the “Albums” tab and select the album which should be called “Recently Deleted”. Step 6. Again, tap on “Select”, select the videos that you just deleted, tap on the trash icon, and delete them from the album. While this is a relatively simple method which gets the job done and takes no more than a minute or so, it won’t permanently delete your videos. Someone can still recover it with recovery apps. If you have already deleted your iPhone videos using the above ordinary method, and you don’t want to recover each of them, you can use another iMyFone Umate Pro feature to delete your recently deleted videos. To do this, follow the steps that we have detailed below. Step 1. Click on “Erase Deleted Files” and then on “Scan” to proceed. Step 2. Your iPhone will now be scanned and once the scan is complete, you’ll be shown all of the deleted data which has been detected. Click on “Photos & Videos” and select the videos which you want to permanently delete. Step 3. Once you’ve selected the videos that you want to permanently delete, click on “Erase Now”. And within a couple of minutes, they will be permanently deleted. As you can see from the different methods that we showed you above, if you want to permanently delete your videos so that they can’t be recovered, using iMyFone Umate Pro is the way to go. 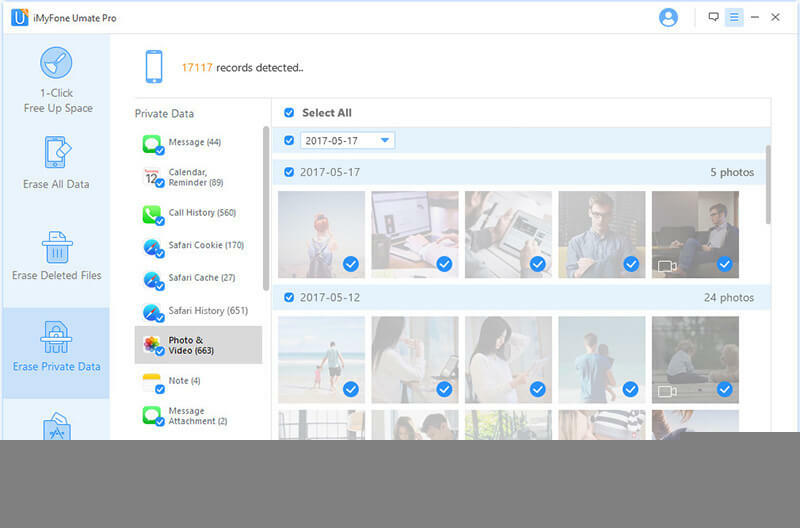 Not only can you use this program for permanently erasing your videos, but it can be used to delete private data, app data, and even completely erase all of your device’s data – it’s without a doubt the best program for deleting your videos permanently.